<< Back Fulgurite Pendant - Solidified Lightning! Fulgurite Pendant - Solidified Lightning! A fulgurite is an incredible object created from desert sand which has been blasted by a bolt of lightning! 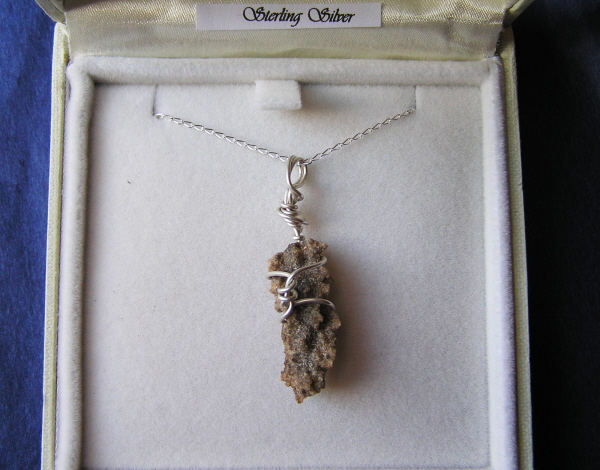 This is a very unusual pendant made from a fulgurite strung from an 18 inch solid sterling silver curb chain. A fulgurite is an incredible object created from desert sand which has been blasted by a bolt of lightning. When the lightning hits the sand it melts it into twisted, forking tubes which then quickly solidify. Fulgurites are very fragile and generally break up when they are excavated. It is very rare to extract pieces more than an inch or so. When you hold this pendant you will get an idea of the terrifying power of nature! The fulgurite won't be this exact one but very similar in size and appearance. Comes boxed in a padded, velvet lined gift box and would make a super gift! You will also receive a signed certificate of authenticity complete with unique holographic serial number.